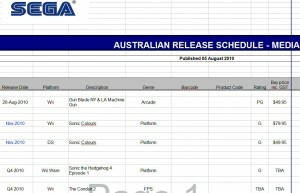 SEGA Australia have issued the above release date schedule(click to enlarge) for their upcoming games and on the list we can see both Wii and DS versions of Sonic Colours are planned for a November release, which fits the original Late 2010 plan perfectly. No exact date is given, but at least Australian fans know what month to save their money for. Sonic titles don’t usually have a big release gap between regions, so hopefully the rest of the world will see a November launch too. We’ll update when we know more. Thanks to Hero of Legend at the SSMB for the heads up! Next Post > Next post: #53 WATCH SOS LIVE AT HOME! :/ i hope U.k. isn’t in december. Normally the difference is just a few days, 14 at most. Play have it for preorder released 26/11/10 though that could change. Still, it brings us hope. As you say, that could change. Retailers only take guesses until the publisher announces a date officially. Lets hope we do get it sometime in November. Hope its going to be released in December here in Europe, since i’m going to get it for Christmas. I’m not going to buy Sonic Colors instead of Call of Duty: Black Ops in release! Australia usually gets games later than or around the same time as Europe. I’m calling it: SA in September, Sonic 4 in October and Colors in November. Really it’s the same month every time a major Sonic game to come out. Calling it now Sonic 4 ep. 1 will be released on the Sonic 2sday. U.S. and Europe release dates haven’t been announced yet, all we know so far is Late 2010. I expect it’ll be released in November if Australia is getting it then. Sonic 4 is supposed to be November too. I don’t like them putting those games so close together. Wow, that’s gotta be vanishingly rare. We hear about an Australian release date BEFORE the Euro one. I just thought, the American release date has gotta be about september or october, seeing as we’re getting a tie-in in the comic, at about issue #119 I think, and that should be around Sept/Oct time. Well Sonic games usually come out pretty close, except in japan, they get them far later for unknown reason. Wait, since SEGA Europe now owns SEGA America and release games in Australia, wouldn’t it mean that’s going to be the date for all 3 places? @ Edge: Nope, things still work the same way. Europe have their date, America have their date, Australia have their date and Japan have their date. But with sonic titles, the dates are usually pretty close, which is good news. Awesomesauce. Better get preordering soon then. lol.